A word of advice, when you see a new program come along with a name that contains a word like "Smart" or "Community", put up your guard and hang onto your wallet. Wind is potentially an electric grid keeper's worst nightmare because the grid keeper must match electrical supply with electrical demand, and erratic wind holds too many surpises. For example, the whole state of Maine could be experiencing strong winds and then rather suddenly, the wind dies down. When the supply can't be depended upon as it can with a source like natural gas, an alternate way to match up supply and demand is to control the demand. Enter the smart meter. "A smart grid would allow the integration of variable energy sources like wind and solar. For example, if electricity output dropped suddenly due to a change in wind generation, the grid could dim the lights in big box stores by 20%, a change most people don't perceive, say Don Von Dollen, program manager for the IntelliGrid project at the Electric Power Research Institute". The more you learn about the so called smart meter, including its demand-regulating role within "central planning's" grand vision, the more it smarts. You don't really need that air conditioner on just because it's 95 degrees and humid and you are trying to sleep, now do you? This section is an opportunity to put some sunlight on smart meters. Please also take a look at the website of the "Smart Meter Safety Coalition", which deals primarily with the health, security and privacy issues surrounding smart meters. 2/8/15 - What Your Electric Company Doesn’t Want You to Know – Smart Meters EXPOSED!! October 8, 2011. On October 4, 2011, Health Canada issued a warning for those under the age of 18 to limit their cell phone use. Click here for document. This warning comes 5 months (May 31, 2011) after the World Health Organization classified radio frequency radiation as a possible human carcinogen and it comes more than a year after cell phone providers issued warnings about the use of cell phones in their user manuals. If Health Canada truly cared about the health of Canadians, this is what they would do. 1. They would issue a warning (similar to that Council of Europe) that wireless routers be replaced with wired routers for internet access in schools, at home, and at work. No one should be exposed for hours each day to pulsed microwave radiation generated by Wi-Fi routers. For places that need to have wireless routers, they should use the patent issued to Swisscom for their “on demand” routers that radiate only when in use. 2. They would issue an immediate ban on wireless baby monitors that emit radio frequency radiation 24/7 and would insist that only “voice activated” baby monitors be sold in Canada. These are available in Europe. Click here for more information. 3. They would issue an immediate ban on cordless phones that emit radiation 24/7 and insist that only ECO DECT plus phones (or those that emit radiaton only when in use) be sold in Canada. These are common in Europe and are now available in North America. 6. They would remove the ban on incandescent light bulbs and insist that compact fluorescent light bulbs be designed so they do not emit UV radiation, dirty electricity or radio frequency radiation and that the bulbs are shatter-proof so that the mercury is not released into the environment during accidental breakage. 7. They would reconsider the deployment of wireless smart meters and determine ways to send the information along wires instead. 8. They would identify and enforce certain places that remain wireless-free (similar to smoke-free environments). This is particularly important in public places (schools, hospitals, hotels, restaurants, libraries) and on public transit (buses, trains, airplanes). 9. They would reduce their exposure guidelines and base these new guidelines on biological effects rather than just thermal effects. 10. They would establish health clinics to deal with the growing number of people complaining about electrohypersensitivity and provideeducational packages for doctors and other health care professionals. If Health Canada truly cared about the Health of Canadians, they could be leaders in this field be adopting the recommendations above. 11/4/11 - Taming Unruly Wind Power - here we see one policy error, industrial wind, begetting a second policy error attempting to fix error # 1, all to be at ratepayer expense. Good money after bad. Note that this approach rejects the idea that wind is a bad idea and that there are better solutions to our energy future than relying on a failed centuries old power source that will never be viable short of changing the very laws of physics. While there is no mention of smart meters in this article, it is the same thing - Big Brother right in your home, messing with electricity demand because with wind, it loses control of electricity supply. 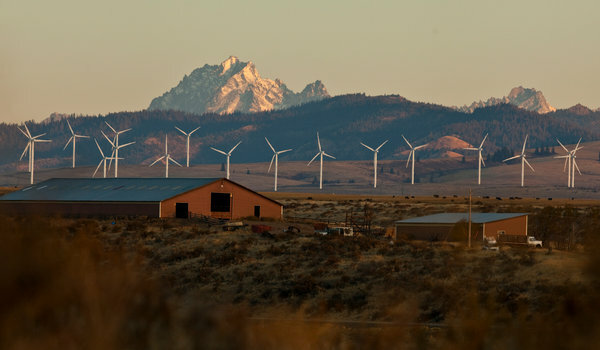 A wind farm near Ellensburg, Wash. Utilities have asked homeowners to help store excess energy to protect the grid. Theresa and Bruce Rothweiler are in one program. For Bonneville, the full dangers of excess supply first hit home during the June 2010 emergency, when a severe storm whipped through the region. The transmission network had so much powerthat the agency turned off all its fossil fuel generation, gave electricity away to neighboring networks and even told the system’s only nuclear plant to slash its production by 78 percent, a highly unusual step. When excess supply threatens the grid, a volunteer's water heater can be turned into a battery. While Bonneville pays for them now, Philip D. Lusk, the power resources manager for the utility department of the city of Port Angeles — the Rothweilers’ retail supplier — said the agency might have to find additional ways of compensating consumers to get the thousands of volunteers it will eventually need to make the system effective. “Smart Meters: A Closer Look” features Smart Meter Safety Coalition members: Elisa Boxer Cook, Sue Foley-Ferguson and Dianne Wilkins. Stewards of the environment are often the first to find conflicts with man-made technologies that outpace safety standards. “Smart” electric meters, the devices Central Maine Power (CMP) is currently installing, are one such technology. There are a number of reasons for concern with CMP’s smart meter program. Probably the two biggest issues are adverse health effects and infringement on the constitutional (Fourth amendment) right to privacy. CMP’s meters communicate by wireless radiofrequency non-ionizing radiation (man-made RF radiation). Thousands of studies of the effects of man-made radiation on plants, animals and humans have been alarming. The unusual signaling characteristics and higher power intensities of radiofrequency (RF) radiation are very different from naturally occurring radiation. Data increasingly show RF radiation from cell phones, smart meters and other wireless devices cause adverse health effects in humans, including cancer. Recently the World Health Organization elevated non-ionizing [not heat producing] RF to their possible carcinogen status. Personal data gathered by smart meters raises constitutionally related privacy issues including identity theft, determination of personal behavior patterns, determination of specific appliances used, real-time surveillance, information from residual data, targeted and or accidental home invasions and censorship. In the old days, one needed probable cause and a search warrant to collect this information. Smart Meter Safety Coalition members have researched these issues extensively and have all been complainants before the Public Utilities Commission. Coalition members have worked and continue working hard to educate and inform Mainers on this issue. Growing movements are spreading rapidly across the country in opposition to the widespread deployments of smart meters, deployments fueled in large part by state funding from the Department of Energy. More and more critics are calling this a massive experiment on the American people and a problem that may become the next asbestos or second-hand smoke. back feeding from houses because people don't spend money to put in a full transfer switch to connect a generator in their house. Many just plug cords from the generator into outlets in the house so it feeds rooms. Unless the circuit breakers are turned off the voltage will go back out through the meter which means the meter will send a signal that it is up. A smart meter is only smart in a perfect world. AUGUSTA — The Maine Office of the Public Advocate is warning Central Maine Power Co. customers that their new wireless "smart" electrical meters could be interfering with other electronic equipment. CMP is replacing 620,000 traditional meters as part of a smart grid program supported by the U.S. Department of Energy. This will eliminate the company's need to read the meters manually, and provide customers the ability to track their electricty use in real time. Public Advocate Eric Bryant said CMP has received 251 complaints regarding radio-frequency interference from customers since the Maine Public Utilities Commission required the electric company to keep a log of the complaints earlier this year. "This is the result of many complaints filed recently with the Public Utilities Commission," Bryant said. "In this case, (the PUC) didn't open an investigation, probably because CMP showed that they were helping people who were complaining about this problem." CMP has a section on its website dedicated to radio-frequency interference, and suggests customers who are experiencing the problem separate the device and the smart meter, adjust the position of the antenna if there is one, and move the wireless device away from any walls that might absorb the signal. Some devices utilize the same channels as the smart meters, and adjustment of those channels can fix the problem. "We're concerned here that there's 200 or so customers that called CMP, and we're concerned there are other customers out there who might not realize the interference they're experiencing is from the smart meters," Bryant said. Customers with further questions can call CMP at 1-877-887-0356, Monday - Friday, 7 a.m. to 8 p.m., or go to www.vsimeterservices.com and click on the postcard icon. For some reason, CMP rejected an option that would keep transmission energy away from people. - It costs too much, and we’re not sure what good it will do. – John Rowe, CEO of Illinois utility ComEd. Hmmm…doesn’t sound so good now, does it? Mike: I wonder if the people in Oakfield and Island Falls realize this and they too may care when it is all too late. I doubt the deer are even there with that whooshing. I do not trust someone controlling my home from far away... or nearby for that matter. I want to get off the grid in the worst way, and I do not want the state and corporations running roughshod over everybody . Solar should be on every roof top. The big companies do not want that, it would benefit the individual consumer and not them. I am hearing that two residents in Lincoln were told by BH that their solar and small wind turbine power should be shut off because of oversupply or lack of demand. This happens often. It is hearsay but probably true. A couple hunters were talking about listening to the turbines from their tree stands. They weren't happy, they wanted to listen for deer and all they heard was whooshing. Maybe they should have listened to the FoLL? yes, Brad it is so terribly tragic and now they are scheduled to come to Oakfield and overlook our spectacular pristine lakes there..I too am broken hearted but a few of us are fighting..they are proposing 50 ...if anyone wants to help us let the DEP know we do not agree and speak from your own experience or if you have ever come to Island Falls to fish or kayak on Lake Mattawamkeag or Pleasant Lake please write Jessica.damon@maine.gov before their decision day of Nov 28..too many people and too much wildlife are suffering for this. My great grandfather William Sewall was born when the natives were here and said they were the best workers on his logging crews- he was a nature guide to TR and learned much of what he knew from the natives. So sad, So sad. Donna, a lot of people share your comment about the photo of Mt. Katahdin. It is tragic, but it must be a wake up call to people before our incredible iconic mountain, revered as the place of the great spirit by our native tribes, is encircled by these dastardly machines. I grew up in Lincoln with that view, and I shed tears of sadness and rage when I took the photo from the north end of Rollins Mt. To clarify: Thermal brick space heaters and water heaters do not "store" the electricity. Electricity is turned into heat by resistance, and the bricks (or water) store the heat, which can be used to heat the house later as needed. The use of the term "battery" is misleading. Batteries store elecricity to be used later as electricity. Decades ago, my sister and her a family lived in a seaside Scottish cottage for a year, Such a space heater warmed the cottage. It was a common device there. A century ago our ancestors used to go on wintertime buggy and sleigh rides with their feet on a flat slab of hot soapstone. The stone had been heated for hours on a wood stove. This was much better than nothing, and was a common practice in rural Maine. The water or bricks store the heat. I don't think there is any practical way to convert that heat energy back into electrical energy.